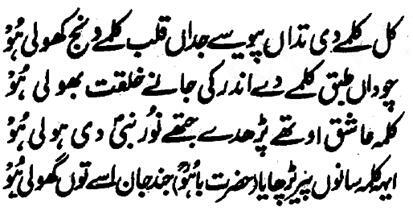 Hazrat Sultan Bahu Rahmatu-Allahe Ta-aala Alaihe says that 'we came to know the reality of the Kalimah when it opened the bud of our heart. Fourteen Strata become lucid through the Kalima. What will the plebs know the reality of the Kalima? That Kalima, through which the Noor of Muhammad is manifested, is ready by the Aashiqeen only. We have been made to read Kalimah (in this way) by our Murshid. Our life and soul is ready to sacrifice on him!